More dates have been set for Clive Nolan's first musical, 'She'. On January 30th 2016 the concert version of 'She' will be performed at the famous Cultuurpodium Boerderij in Zoetermeer, Holland. Subsequently, 'She' in its theatrical version will return to the Cheltenham Playhouse on September 2nd and 3rd. Watch out for further announcements! Clive: "It is very nice to know that the life span of my musical ‘She’ has exceeded my expectations. With the German show immanent and then a trip to Holland and another production in Cheltenham next year, there is plenty left to do with this show. Each time it is performed, it develops a little more, and I am happy to see how this show has matured over the years. I look forward to the continued ‘future’ of ‘She’. Poster by Claudio Momberg with photos by Graham Stead, the Queen by Mark Buckingham. Full Cast Revealed for the Show in Germany! 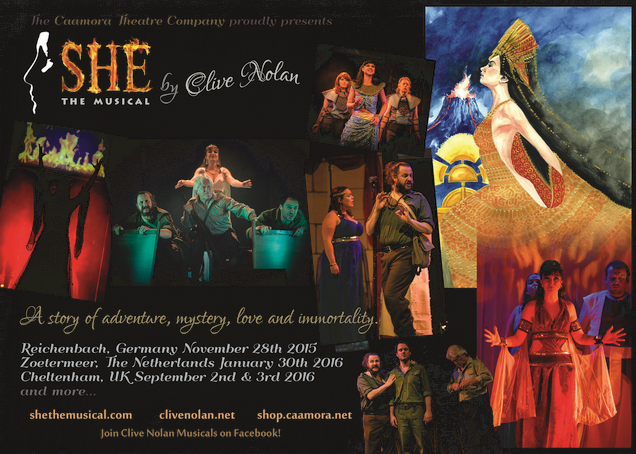 On November 28th the Caamora Theatre Company will perform Clive Nolan's first musical 'She' at the Neuberinhaus Theatre in Reichenbach, Germany. 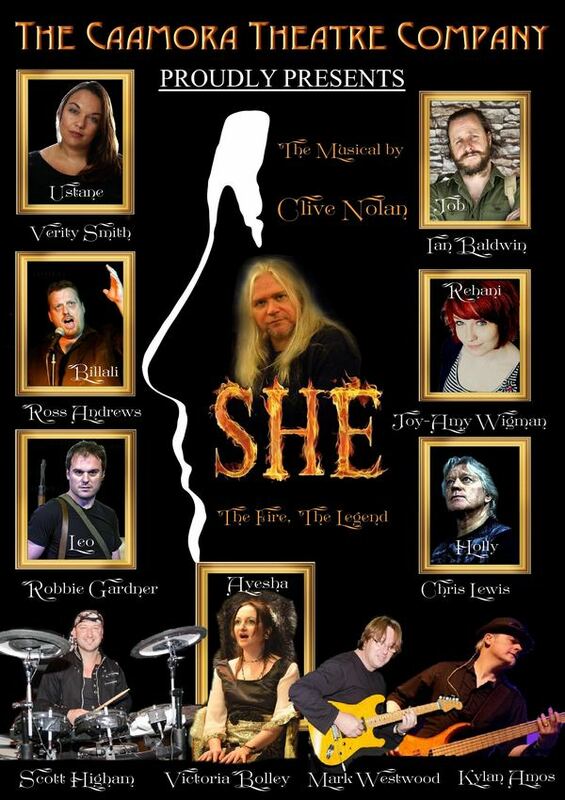 The concert version of 'She' will feature the singers: Victoria Bolley (Ayesha), Robbie Gardner (Leo), Verity Smith (Ustane), Chris Lewis (Holly), Ian Baldwin (Job), Ross Andrews (Billali) and Joy-Amy Wigman (Rehani); the instrumentalists: Clive Nolan (keyboard), Mark Westwood (guitars), Kylan Amos (bass) and Scott Higham (drums); and the chorus including Ollie West, Ron Milsom, Alex White and Emily Frechter. We sincerely hope that Clive, who is currently recovering after two emergency eye operations, will be able to take part in the 'She' show next week. The preparations for what will hopefully be Clive's first public appearance since September are now in full swing... For the Caamora Theatre Company, the show in Germany will be a very special way to conclude what has been a very eventful year. Don't miss it! Clive had to undergo an emergency eye operation due to a detached retina. The operation is believed to have been successful, but the final results will be unknown for at least a month. Clive is currently taking a compulsory recovery break. Here's to a swift and thorough recovery, Mr. Nolan! Clive: "I found myself in the Royal Berkshire Hospital in Reading, where a couple of surgeons did what they had to. It was decided it should be 'local anaesthetic' so that turned out to be a long 70 minutes which I won't describe right now! They believe the operation went well, but the results will be unknown for a while yet. I would be lying if I said this wasn't freaking me out, but I am strengthened by the kind thoughts you have sent me. I just wanted to thank you all for such great messages of support! It made a big difference to my frame of mind. I will do my best to be a 'patient patient', and look forward to annoying you with my music just as soon as I can!" 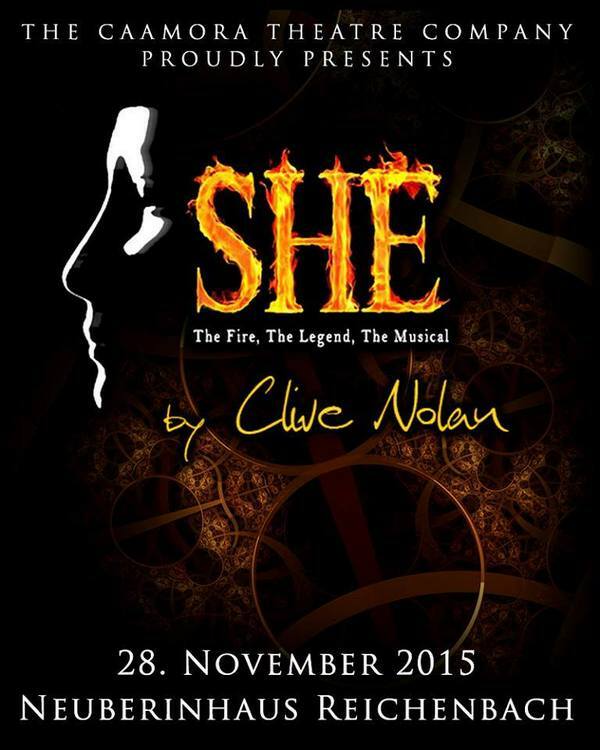 Clive: "On Saturday November 28th we will perform a concert version of ‘She’ in Germany. This is going to be a return to the wonderful Neuberinhaus Theatre in Reichenbach, where we performed ‘Alchemy’ a year ago. The is a very exciting prospect since we enjoyed last year’s show so much. A fantastic reception from an excellent audience. I get to be behind the keyboards again for one of my musicals - back with the band. I’m looking forward to that immensely! I hope to see some friendly faces there." "The Fire and the Quest": We Did It! 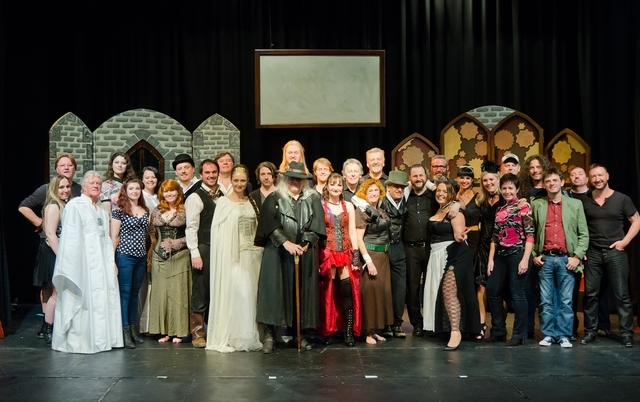 'The Fire and the Quest' festival celebrating 10 years of Clive Nolan Musicals took place on September 4th and 5th, 2015. The artists of the Caamora Theatre Company performed three shows in front of the sold out venue of the Playhouse Theatre in Cheltenham, UK. Clive’s jubilee was commenced with the premiere of a brand new production of his first musical, 'She', followed by the off-West End version of 'Alchemy', both directed by Ian Baldwin. Saturday acoustic concert, hosted by Clive himself and featuring, among others, some of the original performers from both musicals, gave a chance to reminisce about the past 10 years of Clive’s musical journey. The event was a great success and fun for performers and the audience alike. Clive: "There is no doubt that ‘The Fire and the Quest’ weekend is over, and what a fantastic weekend it was! The plethora of terrific performances, the culmination of such brilliant work and preparation, and of course the wonderful reaction of the lovely people who travelled from the corners of the world to see us in action. It’s the audience that really makes a show, and guys… you made it! I felt proud, moved and excited all in one heady mixture! This was truly a lifetime highlight!" Rehearsals for the New 'She' Production!